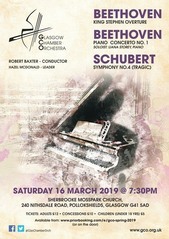 Welcome to the Glasgow Chamber Orchestra ! 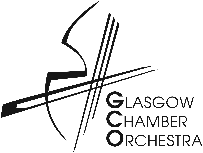 The GCO is an amateur orchestra based in Glasgow, and has been making music for over 60 years. We give 3 main concerts each year in March, June and November. You can find out lots more about the orchestra and its music in the pages of this web-site. Hopefully, you will be encouraged to come along to a concert, or if you are a musician, you may be interested in joining us. We invite you to browse through the site, and if you need more information, there is a Contacts Page so that you can get in touch. 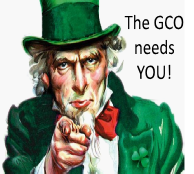 Did you know that you could become a Sponsor of the GCO ? Both Individual and Business sponsorship opportunities exist to support your orchestra. Click on the button below to learn all about our new Sponsorship Schemes! The GCO is always on the look-out for new players. Details on vacancies and how to join the orchestra can be found by clicking the link below. Our next rehearsal will again be a full orchestra rehearsal on Wednesday 24 April, starting at 7.30pm as usual. Please note the change of day! This rehearsal will be in the Balshagray Victoria Park church sanctuary rather than the hall, so entry will be by the lower door on the hillside. In accordance with the General Data Protection Regulation (GDPR) legislation introduced in 2018, GCO has implemented updated policies and procedures to ensure our compliance with this important new law. To read our Data Protection and Retention Policy, please click on the link below. Click on the button below to sample the recordings of this great concert. CDs will be available to purchase in the near future. Our next concert is a biggie!!! A West End Festival concert featuring Borodin’s Polovtsian Dances, Rimsky-Korsakov’s Sheherazade and Tchaikovsky’s Rococo Variations with cellist Balazs Renczes. One not to be missed! The venue is the Bute Hall of Glasgow University, and the date is Saturday 1 June at 7.30 pm. Full details of this exciting concert can be found by clicking on the button below. The GCO has a new vacancy for a French Horn player. Click on the Horn image below to find out more about our audition procedure and how to join the GCO. 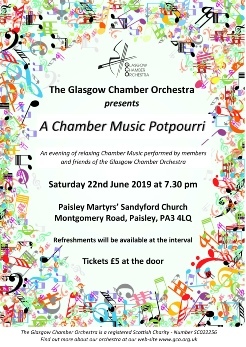 Our popular annual Chamber Concert will take place this year on Saturday 22 June 2018, at our usual venue of Martyrs’ Sandyford Church, Montgomery Road, Paisley, PA3 4LQ. Featuring at potpourri of solos, duets, trios, quartets and ensembles from the ranks of the GCO and friends, this is a relaxing and enjoyable way to spend a couple of hours on a summer Saturday evening. The Concert starts at 7.30pm. Tickets are £5, available at the door on the day. 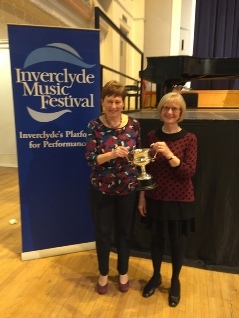 Congratulations to GCO string players Anne Armour (violin) and Jan Anderson (cello) who have lifted a trophy at the recent Inverclyde Music Festival - but NOT as string players! Anne is also a soprano, and with Jan as her pianist, they won the Lieder Class at the Festival. This is the fifth year in a row that Anne and Jan have lifted the trophy. Multi-talented indeed. Well done ladies!